RelayFax is an application that can be used for the management of faxes, automating their sending and reception process. This is its main advantage, and it makes it a really useful application, that simplifies the process and provides other extra functions. 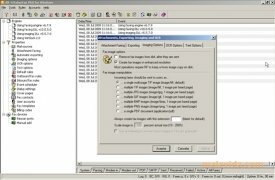 With this software it is possible to transfer faxes from any computer and from different applications, like for example an email client, a text processor for Word,... To do so, all we have to do is input the fax number, the text to be sent and press the send button. - Send faxes from any terminal that has the application installed by means of the "Print" option. - Send faxes from the RelayFax accounts configured in the program. - Compatibility with the majority of email clients: Outlook, Outlook Express, Thunderbird, etc. - Convert faxes to TIF, JPG or BMP so that they can be stored. - Automatic fax conversion by means of OCR to Word or PDF, so that it can be edited later. - Convert email attached files to fax format. - Send faxes to multiple addressees. This download requires a free registry. The trial version can be used during 30 days.